Best shot: Coffee - how do you brew? Whether it's to wake us up or keep us coding, for many techies coffee is an essential part of our daily ritual. With my bean-to-cup machine away being repaired, I've had to find other ways to get my fix. 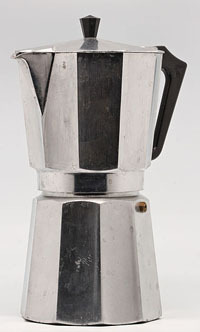 The trusty standby moka pot is my normal way of brewing up when the big machine's broken, but what are the alternatives? I certainly don't fancy going back to the first coffee I ever tasted: Mellow Birds instant added to a saucepan of hot milk. Most readers will likely have come across a few of the usual ways of making coffee: a filter, a cafetière (French press) and the various types of capsule machine like Nespresso, so beloved of proprietors seeking to bring an air of chic to a budget hotel room. Rather than look at those, I decided to try a few of the less well-known options. The newest of the methods I've looked at here, Aerobie's Aeropress, could perhaps be described as the hipster coffee maker. It's also cheap, simple to use and lightweight enough that if you want to be a coffee bore, you can take it with you when you visit friends who have a disturbing penchant for instant. Essentially, the Aeropress is a simple plastic tube with gradations marked on the side and a perforated lid that screws onto one end. To make a coffee, you pop a fine paper filter into the lid, screw it on and then stand the tube on top of your coffee cup. Add a scoop or two of coffee, fill with hot water, up to one of the marks on the side, and stir the grounds for around 10 seconds. Then, you slide the plunger into the top and slowly press it down. The air between plunger and water forces the water through the coffee. Just press until done. That might sounds pretty much like a cafetière, but here the water's all gone by the time you finish, and the paper filter is much finer than the typical metal mesh, so the coffee's much less gritty. You can get a pretty strong shot from it, too - but it's not really espresso, and there's no crema*. Some aficionados add extra water after brewing to make a longer coffee. 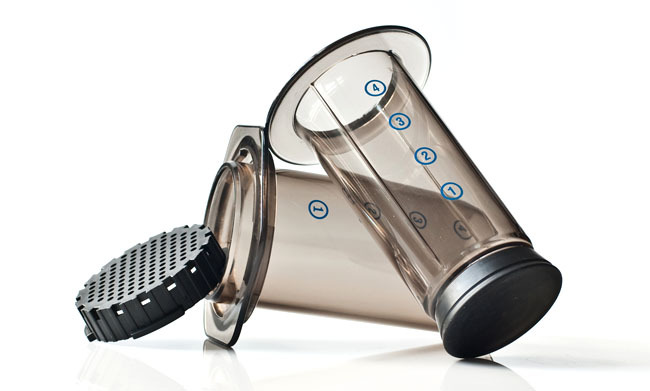 And there are alternative methods, such as the "reverse aeropress", which some claim makes a better tasting cup. A handy holder for the filters is included in the pack, and cleaning is simple: unscrew the cap, hold over the bin and press the plunger the rest of the way to eject the ground and filter. The pack also includes a funnel that can be used both to ease the adding of grounds or to make it simpler to fill a flask or cup with a narrower neck than the cylinder. At £23.65, and with replacement filters £3.99 for 350, it's also pretty good value. Will arrival of Hare accelerate tortoise-like performance?